DIE Jovis, 7 die Februarii. Avowries and Replevins in Wales, &c. Bill. Message to H. C. that the Lords will give a Conference about refusing them One concerning L. Mordant's Trial. Message from the King, about a Recess. 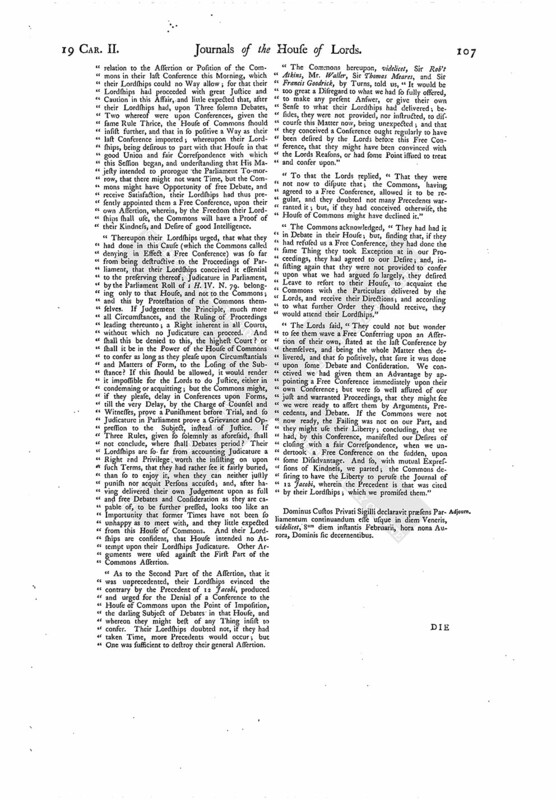 Report of the Conference about refusing One to H. C. concerning L. Mordant's Trial. Heads for the Conference about refusing One with H. C. concurring L. Mordant's Trial. Protest against a Free Conference with H. C. about this Business. Gw'nns and Pritchard to be released. Marq. and March of Worcester recommended to the King. Report of the Conference with H. C. about the Answer to their Message concerning L. Mordant's Trial. Robertus Comes Lindsey, Magnus Camerarius Angl. The Amendments in the Bill concerning the Lord Abergaveny, brought from the House of Commons Yesterday, were read; and, after some Consideration had thereof, the said Amendments were committed to the same Committee as formerly, who are to meet this Afternoon, at Four of the Clock. Hodie 2a vice lecta est Billa, "An Act extending a former Act concerning Replevins and Avowries to the Principality of Wales, and the County Palatines." And accordingly the House was presently adjourned into a Committee for that Purpose. 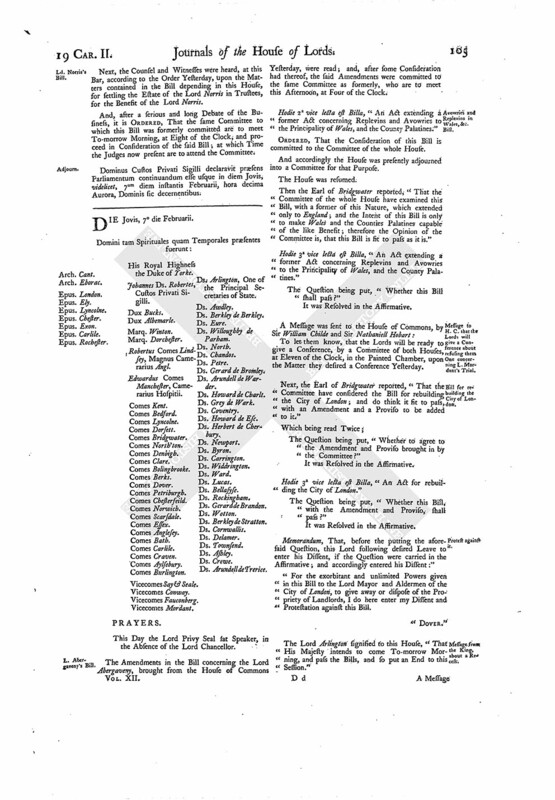 Then the Earl of Bridgwater reported, "That the Committee of the whole House have examined this Bill, with a former of this Nature, which extended only to England; and the Intent of this Bill is only to make Wales and the Counties Palatines capable of the like Benefit; therefore the Opinion of the Committee is, that this Bill is sit to pass as it is." Hodie 3a vice lecta est Billa, "An Act extending a former Act concerning Replevins and Avowries to the Principality of Wales, and the County Palatines." To let them know, that the Lords will be ready to give a Conference, by a Committee of both Houses, at Eleven of the Clock, in the Painted Chamber, upon the Matter they desired a Conference Yesterday. Next, the Earl of Bridgwater reported, "That the Committee have considered the Bill for rebuilding the City of London; and do think it fit to pass, with an Amendment and a Proviso to be added to it." The Question being put, "Whether to agree to the Amendment and Proviso brought in by the Committee?" Hodie 3a vice lecta est Billa, "An Act for rebuilding the City of London." The Question being put, "Whether this Bill, with the Amendment and Proviso, shall pass?" Memorandum, That, before the putting the aforesaid Question, this Lord following desired Leave to enter his Dissent, if the Question were carried in the Affirmative; and accordingly entered his Dissent:"
"For the exorbitant and unlimited Powers given in this Bill to the Lord Mayor and Aldermen of the City of London, to give away or dispose of the Propriety of Landlords, I do here enter my Dissent and Protestation against this Bill. The Lord Arlington signified to this House, "That His Majesty intends to come To-morrow Morning, and pass the Bills, and so put an End to this Session." To acquaint them, that the Lords have passed the Bill concerning Avowries and Replevins in the Principality of Wales, &c.
2. To return them the Bill for rebuilding the City of London; to which the Lords have added a Proviso, and made an Amendment, whereunto the Lords desire the Concurrence of the Commons. That they will come to the Conference, as is desired. The Commons being come, the House was adjourned during Pleasure, and the Lords went to the Conference; which being ended, the House was resumed. The Earl of Anglesey reported the Effect of the Conference with the House of Commons; which was managed by Sir Rob't Atkins, who said, "That the House of Commons have desired this Conference concerning their Lordships Answer to a Message concerning a Free Conference. In their Lordships Answer, in Effect, their Lordships denied a Free Conference. He said, He was commanded to acquaint their Lordships, That Conferences, and Free Conferences, when desired, are essential to the Proceedings of Parliament, the only Means to preserve the good Correspondence between the Two Houses of Parliament; and the Denial thereof, destructive to the Proceedings of Parliament, and unprecedented." The Question being put, "Whether to desire a Free Conference from the House of Commons upon the Subject-matter of the last Conference?" To desire a present Free Conference, in the Painted Chamber, by a Committee of both Houses, concerning the Subject-matter of their last Conference. The Committee for Bedford Levell was appointed to meet this Afternoon, at Four a Clock. That the House of Commons will give a Free Conference, as is desired. "1. 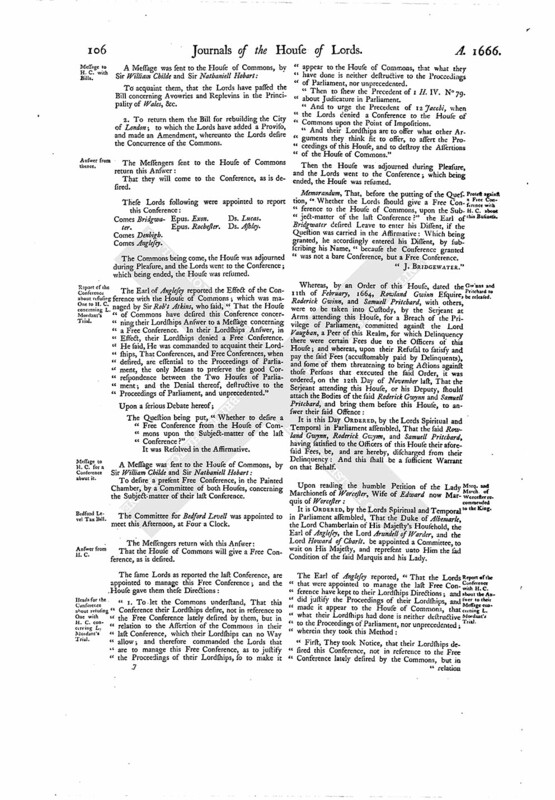 To let the Commons understand, That this Conference their Lordships desire, not in reference to the Free Conference lately desired by them, but in relation to the Assertion of the Commons in their last Conference, which their Lordships can no Way allow; and therefore commanded the Lords that are to manage this Free Conference, as to justify the Proceedings of their Lordships, so to make it appear to the House of Commons, that what they have done is neither destructive to the Proceedings of Parliament, nor unprecedented. "Then to shew the Precedent of 1 H. IV. N° 79. about Judicature in Parliament. "And to urge the Precedent of 12 Jacobi, when the Lords denied a Conference to the House of Commons upon the Point of Impositions. "And their Lordships are to offer what other Arguments they think fit to offer, to assert the Proceedings of this House, and to destroy the Assertions of the House of Commons." Memorandum, That, before the putting of the Question, "Whether the Lords should give a Free Conference to the House of Commons, upon the Subject-matter of the last Conference?" the Earl of Bridgwater desired Leave to enter his Dissent, if the Question was carried in the Affirmative: Which being granted, he accordingly entered his Dissent, by subscribing his Name, "because the Conference granted was not a bare Conference, but a Free Conference. It is this Day ORDERED, by the Lords Spiritual and Temporal in Parliament assembled, That the said Rowland Gwynn, Roderick Gwynn, and Samuell Pritchard, having satisfied to the Officers of this House their aforesaid Fees, be, and are hereby, discharged from their Delinquency: And this shall be a sufficient Warrant on that Behalf. It is ORDERED, by the Lords Spiritual and Temporal in Parliament assembled, That the Duke of Albemarle, the Lord Chamberlain of His Majesty's Household, the Earl of Anglesey, the Lord Arundell of Warder, and the Lord Howard of Charlt. be appointed a Committee, to wait on His Majesty, and represent unto Him the sad Condition of the said Marquis and his Lady. "First, They took Notice, that their Lordships desired this Conference, not in reference to the Free Conference lately desired by the Commons, but in relation to the Assertion or Position of the Commons in their last Conference this Morning, which their Lordships could no Way allow; for that their Lordships had proceeded with great Justice and Caution in this Affair, and little expected that, after their Lordships had, upon Three solemn Debates, Two whereof were upon Conferences, given the same Rule Thrice, the House of Commons should insist further, and that in so positive a Way as their last Conference imported; whereupon their Lordships, being desirous to part with that House in that good Union and fair Correspondence with which this Session began, and understanding that His Majesty intended to prorogue the Parliament To-morrow, that there might not want Time, but the Commons might have Opportunity of free Debate, and receive Satisfaction, their Lordships had thus presently appointed them a Free Conference, upon their own Assertion, wherein, by the Freedom their Lordships shall use, the Commons will have a Proof of their Kindness, and Desire of good Intelligence. "Thereupon their Lordships urged, that what they had done in this Cause (which the Commons called denying in Effect a Free Conference) was so far from being destructive to the Proceedings of Parliament, that their Lordships conceived it essential to the preserving thereof; Judicature in Parliament, by the Parliament Roll of 1 H. IV. N. 79. belonging only to that House, and not to the Commons; and this by Protestation of the Commons themselves. If Judgement the Principle, much more all Circumstances, and the Ruling of Proceedings leading thereunto; a Right inherent in all Courts, without which no Judicature can proceed. And shall this be denied to this, the highest Court? or shall it be in the Power of the House of Commons to confer as long as they please upon Circumstantials and Matters of Form, to the Losing of the Substance? If this should be allowed, it would render it impossible for the Lords to do Justice, either in condemning or acquitting; but the Commons might, if they please, delay in Conferences upon Forms, till the very Delay, by the Charge of Counsel and Witnesses, prove a Punishment before Trial, and so Judicature in Parliament prove a Grievance and Oppression to the Subject, instead of Justice. If Three Rules, given so solemnly as aforesaid, shall not conclude, where shall Debates period? Their Lordships are so far from accounting Judicature a Right and Privilege worth the insisting on upon such Terms, that they had rather see it fairly buried, than so to enjoy it, when they can neither justly punish nor acquit Persons accused; and, after having delivered their own Judgement upon as full and free Debates and Consideration as they are capable of, to be further pressed, looks too like an Importunity that former Times have not been so unhappy as to meet with, and they little expected from this House of Commons. And their Lordships are confident, that House intended no Attempt upon their Lordships Judicature. Other Arguments were used against the First Part of the Commons Assertion. "As to the Second Part of the Assertion, that it was unprecedented, their Lordships evinced the contrary by the Precedent of 12 Jacobi, produced and urged for the Denial of a Conference to the House of Commons upon the Point of Imposition, the darling Subject of Debates in that House, and whereon they might best of any Thing insist to confer. Their Lordships doubted not, if they had taken Time, more Precedents would occur; but One was sufficient to destroy their general Assertion. "The Commons hereupon, videlicet, Sir Rob't Atkins, Mr. Waller, Sir Thomas Meares, and Sir Francis Goodrick, by Turns, told us, "It would be too great a Disregard to what we had so fully offered, to make any present Answer, or give their own Sense to what their Lordships had delivered; besides, they were not provided, nor instructed, to discourse this Matter now, being unexpected; and that they conceived a Conference ought regularly to have been desired by the Lords before this Free Conference, that they might have been convinced with the Lords Reasons, or had some Point issued to treat and confer upon." "To that the Lords replied, "That they were not now to dispute that; the Commons, having agreed to a Free Conference, allowed it to be regular, and they doubted not many Precedents warranted it; but, if they had conceived otherwise, the House of Commons might have declined it." "The Commons acknowledged, "They had had it in Debate in their House; but, finding that, if they had refused us a Free Conference, they had done the same Thing they took Exception at in our Proceedings, they had agreed to our Desire; and, insisting again that they were not provided to confer upon what we had argued so largely, they desired Leave to resort to their House, to acquaint the Commons with the Particulars delivered by the Lords, and receive their Directions; and according to what further Order they should receive, they would attend their Lordships." "The Lords said, "They could not but wonder to see them wave a Free Conferring upon an Assertion of their own, stated at the last Conference by themselves, and being the whole Matter then delivered, and that so positively, that sure it was done upon some Debate and Consideration. We conceived we had given them an Advantage by appointing a Free Conference immediately upon their own Conference; but were so well assured of our just and warranted Proceedings, that they might see we were ready to assert them by Arguments, Precedents, and Debate. If the Commons were not now ready, the Failing was not on our Part, and they might use their Liberty; concluding, that we had, by this Conference, manifested our Desires of closing with a fair Correspondence, when we undertook a Free Conference on the sudden, upon some Disadvantage. And so, with mutual Expressions of Kindness, we parted; the Commons desiring to have the Liberty to peruse the Journal of 12 Jacobi, wherein the Precedent is that was cited by their Lordships; which we promised them." Dominus Custos Privati Sigilli declaravit præsens Parliamentum continuandum esse usque in diem Veneris, videlicet, 8um diem instantis Februarii, hora nona Aurora, Dominis sic decernentibus.